Join us for the Premier of Idaho the Movie 2, sponsored by The Nature Conservancy and presented by Wide Eye Productions. The screening is FREE and appropriate for all ages. The film reveals timeless beauty in Idaho’s untouched places. The event is a fundraiser for The Nature Conservancy and all Raffle proceeds will go to support conservation efforts in Idaho (raffle tickets are $5.00 each). Idaho the Movie 2 features all new aerial cinematography of the entire state filmed in 5K – images nearly 3 times higher resolution than high definition. Idaho the Movie 2 is written and narrated by Tim Woodward. The film also features interviews with several Idaho artists, including singer-songwriter Eilen Jewell; Watercolorist Norm Nelson; Photographer Greg Sims; wooden boat craftsman, Andy Kerfoot; and painter and ceramics artist, Suzanne Lee Chetwood. THIS SHOWING IS NOW SOLD OUT. 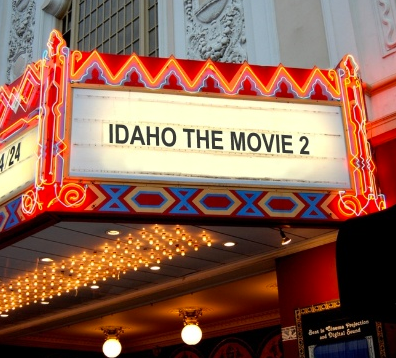 WATCH IDAHO THE MOVIE 2 ON BROADCAST STATIONS AROUND THE NORTHWEST. CLICK HERE FOR AIR DATES. Please have another showing at the Egyptian! I’m sorry but we could only secure one night at the Egyptian Theatre in Boise. You may watch the film this Friday, November 25th at 7pm on KTVB Channel 7. BluRays and DVDs go on sale this week, as well. Enjoy!